We are now 8 days away from Christmas and for those who have not finished their Christmas shopping the scramble is on. We at Cue Sport Nation would like to pass along a few ideas to help you buy for that pool crazed person in your family. Learn the run out patterns of the best players in the world! We are lucky enough to have Run Out Media as one of our major sponsors this year. Because of this we have some great products for sale. For those of you who have not heard of Run Out Media, it is a Canadian company run by Nathan DuMoulin. 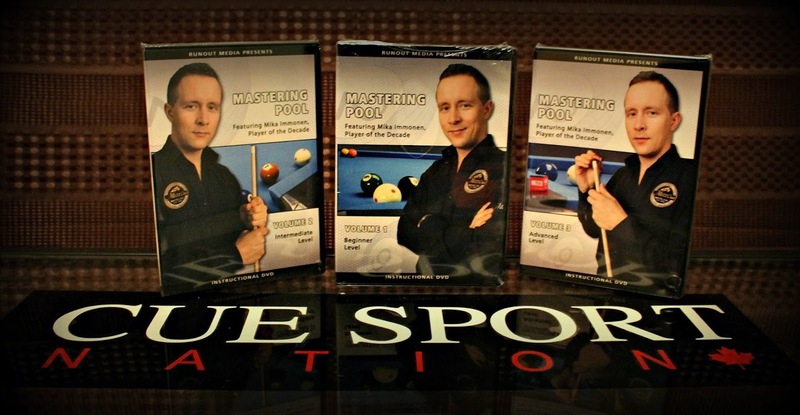 He has worked with all of the top players in the world and with his unique style he has become the new standard for instructional DVDs. He is also the one responsible for the massively popular "Venom Trickshots" series done by world renowned trick-shot artist Florian "Venom" Kohler. Some of the best trick-shots you will see anywhere. We also have 3 "Hustlin" hats remaining as well as our own Cue Sport Nation t-shirts, however most of them are in a medium seize as we our at the end of our order. For more details on pricing I can be contacted through facebook or by email at markus.noe@live.com. Merry Christmas to all and Happy Holidays.